Spending the day in Tel Aviv can be very tiring. Why you ask? Because if you aren’t a native, and don’t know the bus system, you are going to end up walking a ton like I did. 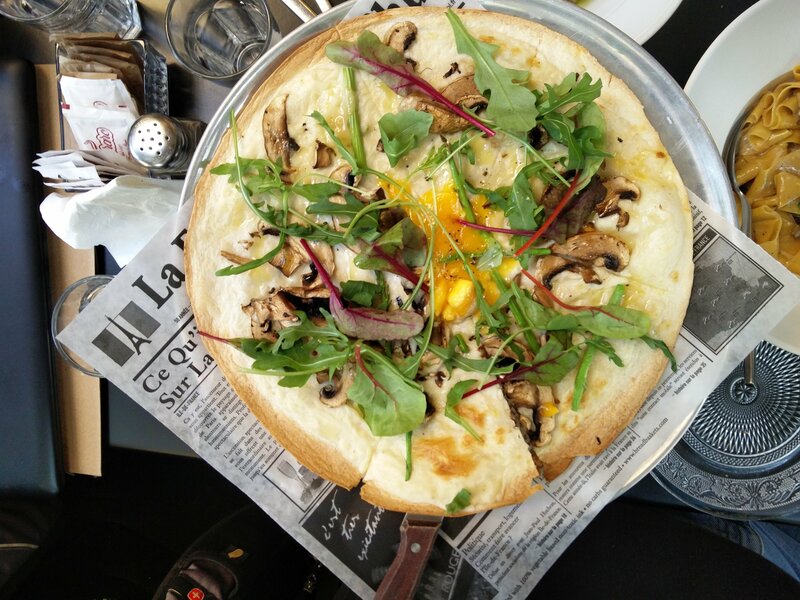 After having a meeting in south central TLV, I called a friend of mine to meet up for lunch. 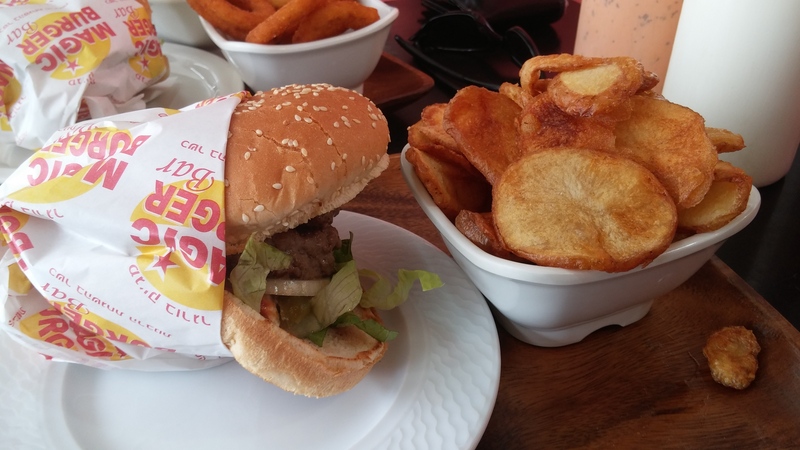 Problem is, it’s very hard to find a good kosher burger in the city of TLV, let alone a great one. 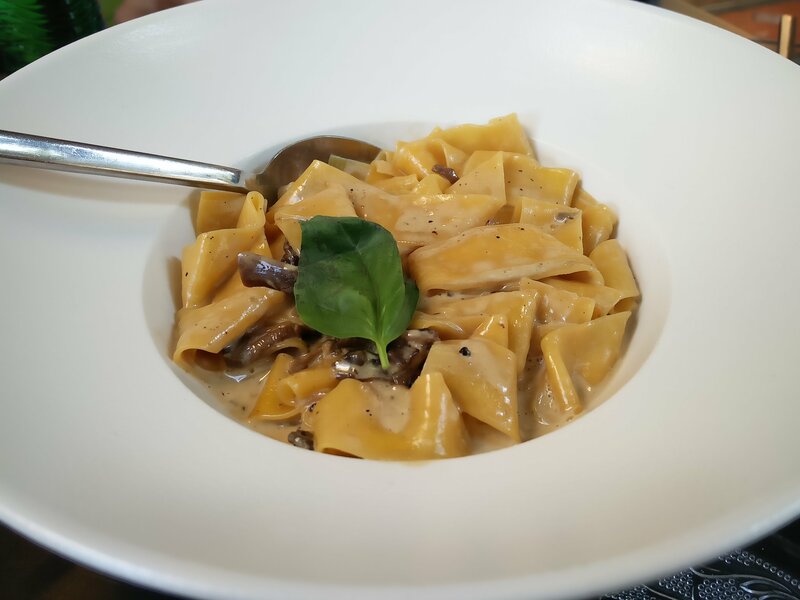 The trend in Tel Aviv is that a lot of restaurants are going kosher but in baby steps. 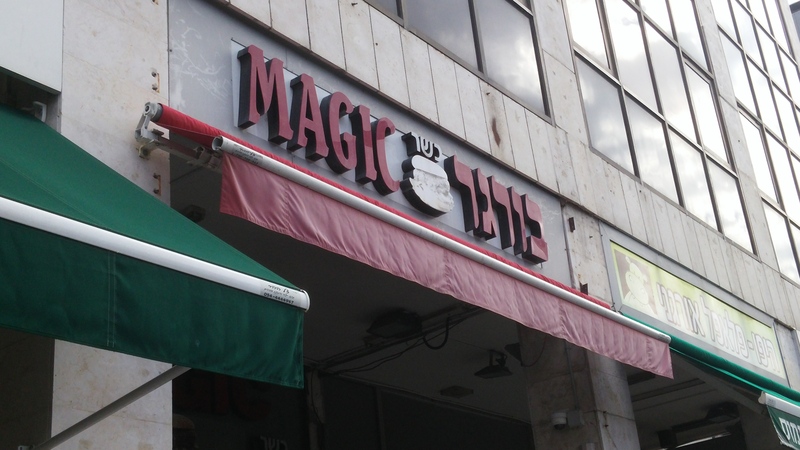 So after looking online we found a kosher fast food burger joint called Magic Burger(Ibn Gvirol 64, Tel Aviv, Rabbanute Tel Aviv). 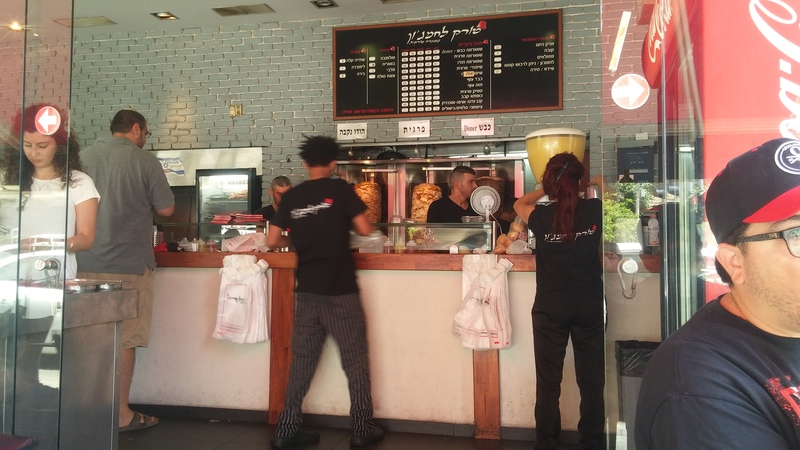 Located next to the very popular and famous shwarma joint Dabush(also Kosher) where the Israelis have been fascinated by the robotic shwarma cutter for those who didn’t know that. 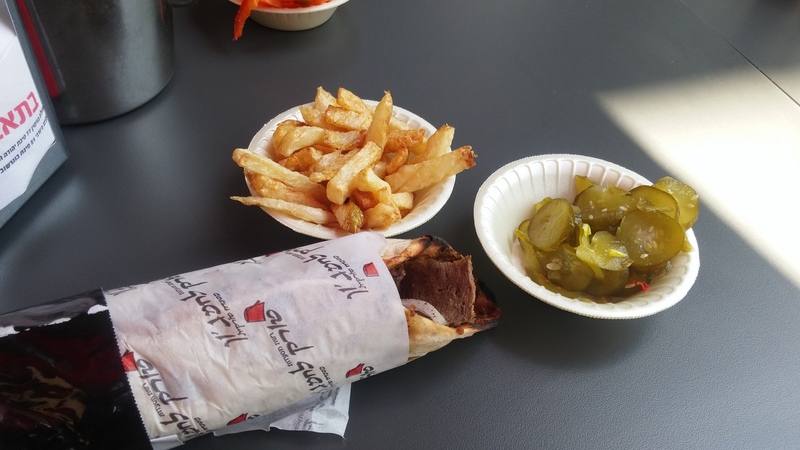 In addition, the shwarma is spot on as well. 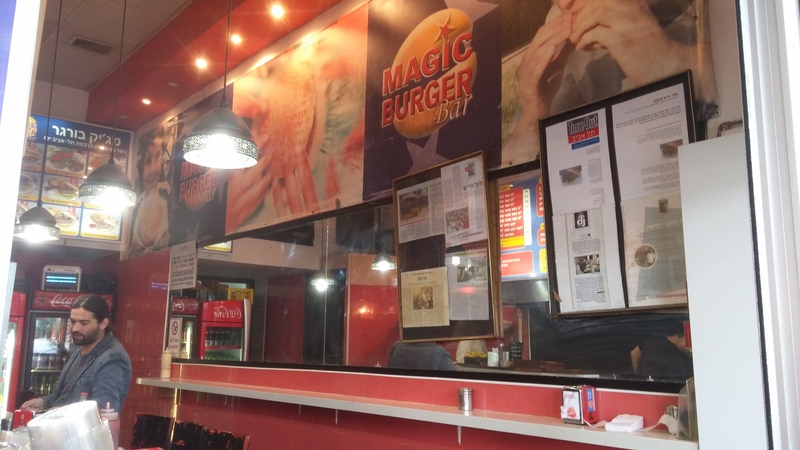 Back to Magic Burger, after walking up an appetite, I checked out the menu and it’s pretty straight forward. Hamburgers, Lamb Burgers or Chicken breast sandwiches. The place has been opened for a while and they have tried to mimic the classic american hamburger joints across america. the design is very simplistic and straight forward as their menu. 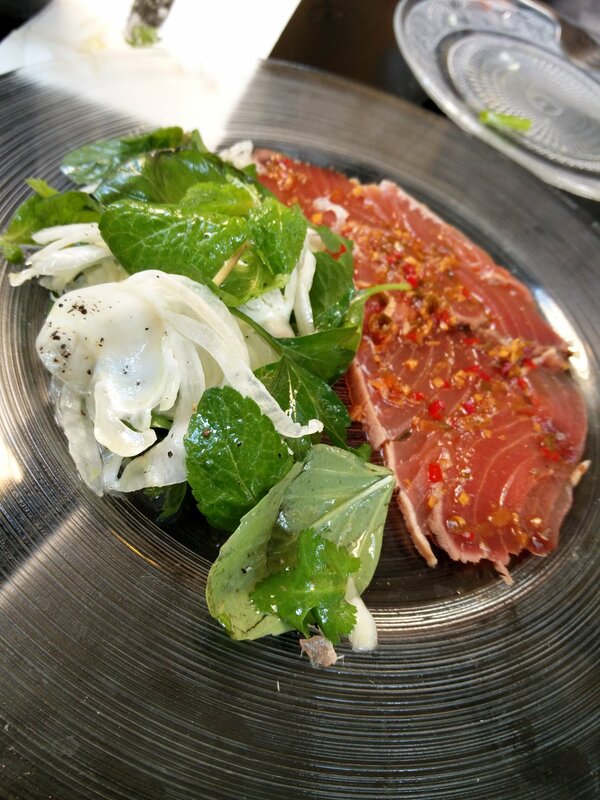 Back to the food. We both ordered hamburgers, I ordered a 400 grams which came as 2 patties stacked high, with a side of fresh cut potato slices.. I had a whole conversation with the owner about the place while taking my order about why he put’s wights on the burgers. He was claiming it speeds up the cooking process while I was saying, it pushes all the juices out of the burger. In the end he didn’t flatten our burgers and it took a bit longer but it was worth the wait. The sandwich was very big. Fitting in the two patties into the paper to hold the thing together was a challenge for the cook but he did a good job. My burger looked like it was going to eat my plate of fries! After glancing at this sandwich while adding lettuce, tomatoes, pickles and raw white onions it was a great and flavorful burger from start to finish. only problem was they didn’t toast the bun and it got soggy very fast, but the flavor was their all the way through. The potato slices where crispy and fresh which really took the meal to the next level. But it really is all about the burger at Magic Burger. 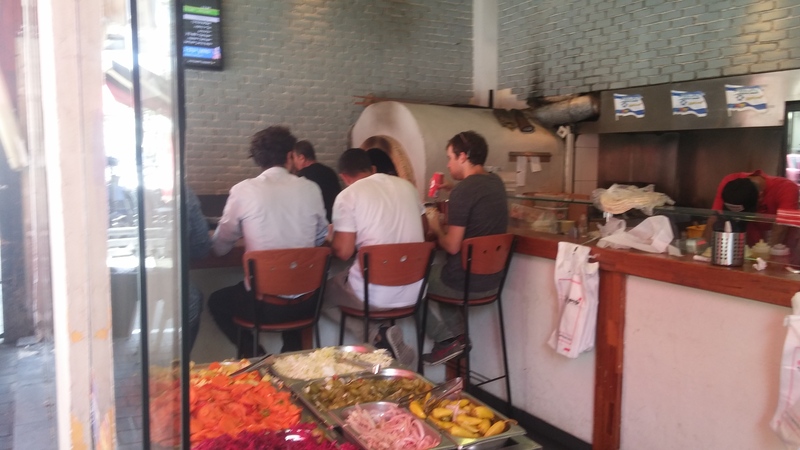 If you are going to go there, and try it out, first of all I highly recommend it, secondly plan your trip ahead of time because I ended up walking to the Bursa to catch the bus home and worked of that delicious lunch. 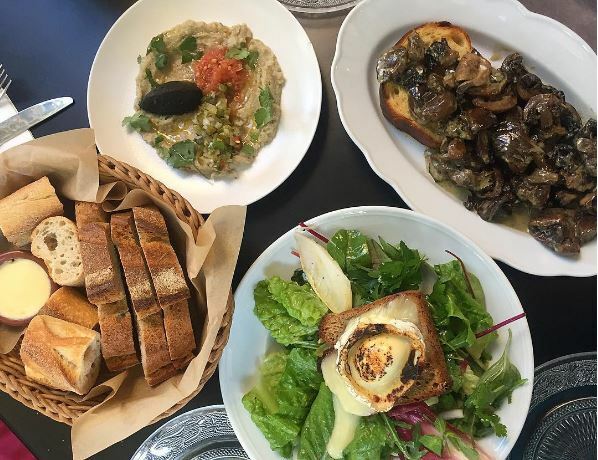 So If you are traveling to Tel Aviv or are a local and have never been, try it out, it’s worth the trip! My trip to TLV got Wings! 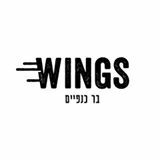 After months of talking about how, when a reason comes up to travel to Tel Aviv, I will have to try out the new Wings Bar. Finally after months of not seeing why I need to leave the holy city of Jerusalem, I had a reason to go and will finally be able to try it out. 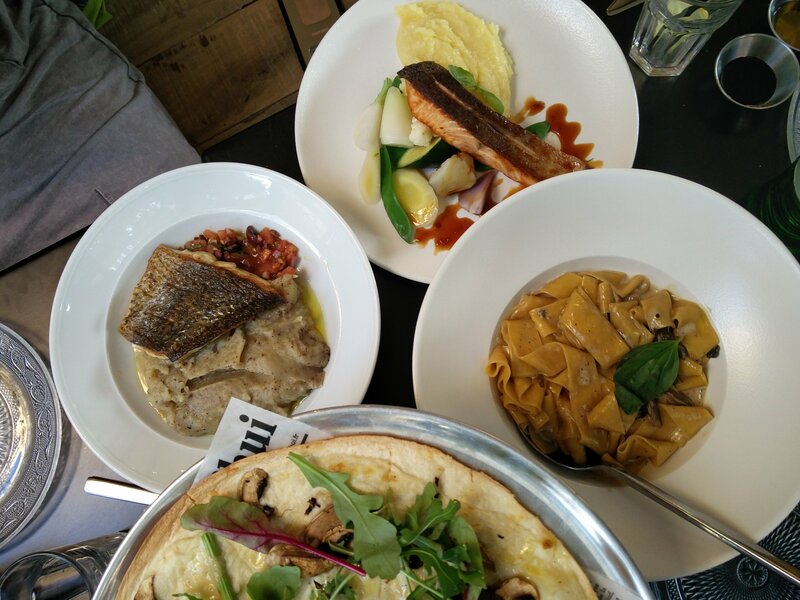 For those of you who don’t know about the kosher culinary scene in Tel Aviv, I must share. Everywhere you turn today you can find something kosher. Unlike 10 years ago, the only kosher food item was a bakery or really expensive restaurants. But today anywhere you turn you can find something different to eat if it’s a cafe or a fast food joint or even some really funky places around the Carmel Market. 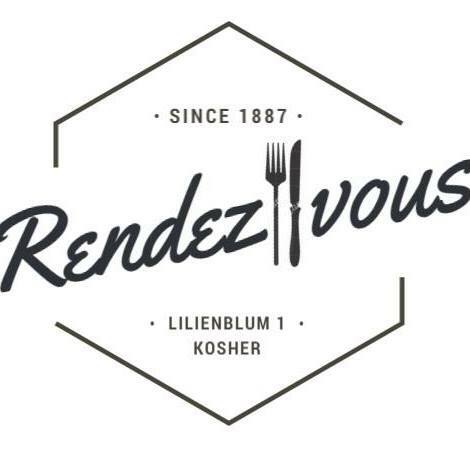 For those who keep kosher, you do not have to be afraid to eat in the big city anymore, Bon Apetite. 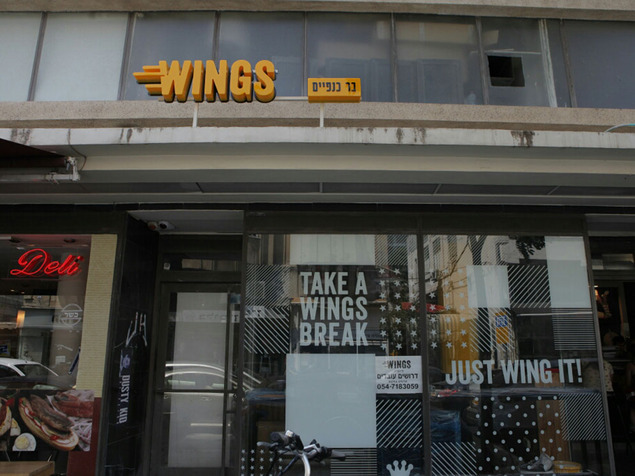 Wings bar is located in central Tel Aviv, in the shadows of the Shalom tower. What I find cool about the location of the joint is that if you fancy wings but your friends fancy something else, there is a Asian stir fry place on one side and a deli on the other. The wings are king though because the concept of the place is based only on deep fried crunchy chicken wings. “It’s all about the wings” the owner Eitan White told me. 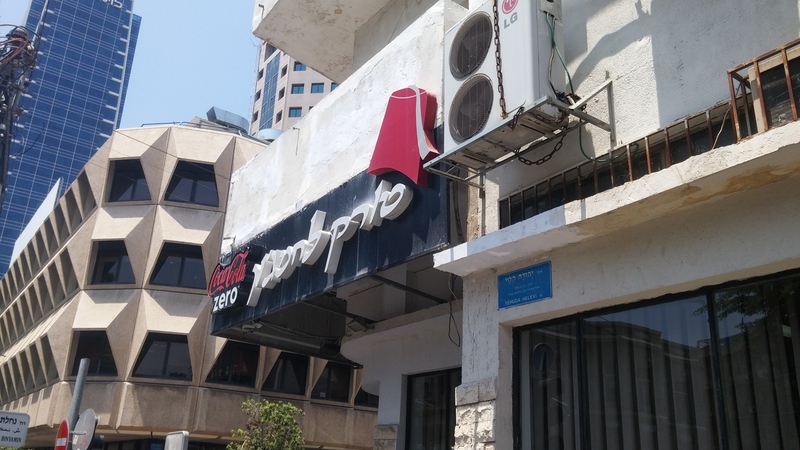 When he opened this place with his partner Robert ben Or (who I didn’t get to meet sadly) he told me that this is the only kosher wings bar in the world! The concept was so unique, that chef Leon Elkalay had to get in and help these guys create the menu for the wings bar. When I sat down to talk to Eitan about this funky joint, it really was a dream come true for him. 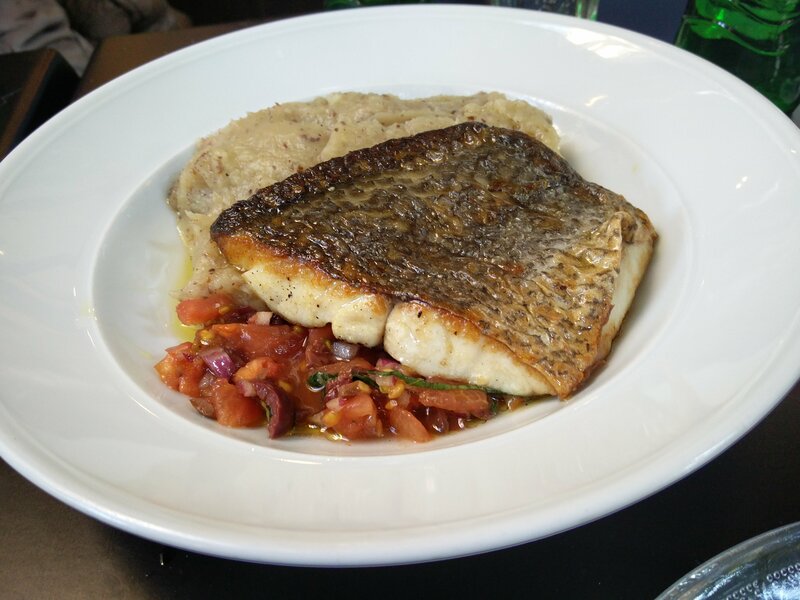 Coming from the hi tech world into the culinary industry is a big risk and it payed off. From cooking for friends on Sunday night football to here. A journey that is taking flight very quickly. The wings bar is all about the sauces. 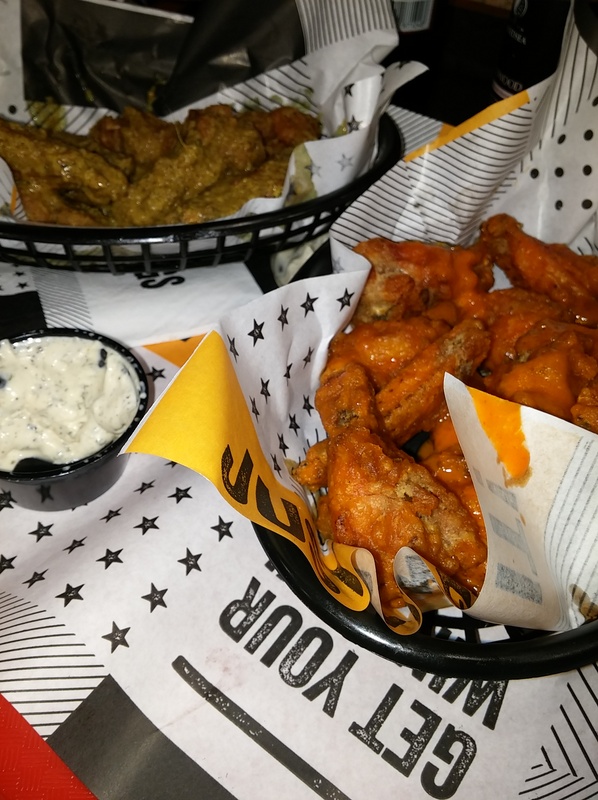 The wings are all battered and deep fried , but the sauce is what makes the wings. They have an extensive list of sauces but me and my friend ordered the buffalo and curry. Eitan told me after that you can order the wings and get the sauces separately or to order half and half. We ordered onion rings too. The wings were cooked to perfection like I said, but what surprised me was the battered onion rings, they were amazing. The buffalo wings were very spicy but full of flavor, and the curry wings were sweet and savory deliciousness. The wings come in batches of 8/12/16 and you can leave there without damaging your wallet too. I highly recommend anyone in the area to go and try it out because the wings bar is a legit!